Batteries, Chargers, and Battery Management Systems. qwerkus wrote: Anyone tried to weld or solder 5*0.2mm nickel plated copper solar bus wire ? It's cheap, supposedly copper and already protected against corrosion and, with a cross sectional area of 1mm2, it should be able to handle 12A. I wonder how the plating would influence the welding process. I just ordered, will report in few weeks. great. im interested to know what happens. i suspect the tinned coating might sort of explode with welding, as the current will need to be very high to weld the copper. yeah, tin sort of boils and explodes when you weld. But It's worth a try for couple of $. Zink/nickel plating of copper seems to be easy but I haven't yet had time to explore how this plating impacts welding. i did a while ago and was not impressed. i Ni plated the copper myself, and tried spotwelding it. the results were not too good from memory, but perhaps i was doing it wrong. they do use it in power tool packs though, with spotwelding so there must logically be a way. it would be a nice material. vex_zg wrote: i tried tungsten, molybdenum, 30-70 copper tungsten. Tested for welding copper, nickel, copper-nickel. pure copper electrodes still work best for me. Tungsten/molybdenum cause more sparks and blowouts and stick much more. Anybody willing to experiment can get cheap on aliexpress/ebay. Beware though - machining tungsten and molybden is quite hard. Those are hard materials. Eats grinding stone like it was cake. Use green grinding wheels, aluminum oxide wheels will dissolve grinding tungsten. new info for me is that sodium benzotriazole is a good copper corrosion inhibitor. you can just dip the copper. haven't done it yet. electroplating [nickel] is pretty damn fun though"
it looks like the "boss level" welder has no trouble with .1mm copper strip and this guide, which seems more conservative than most, shows .1mm nickel x7mm strip doing 3amps comfortably, so with copper being 4 times as conductive couldn't I do a .1mm x 28MM FOLDED STRIP and that would net me 48 amps? .1mm copper is a really thin thing. Yes weldable, some people use it, but it's really weak mechanically. I'd rather use double .2mm nickel for the same conductivity. That's just my opinion, some will disagree. Like I've said here before... the cells should be held together with glue or in holders. Never rely on the electrical connections to hold the batteries together... nickel, copper or otherwise, the spot welds are simply not enough... and hence they should bare no mechanical loading. Don't find them much inspiring, myself, and a bit rich for my blood. Just thought I'd offer it up as an option (of sorts). this one is most versatile I've see and only 2 cells. really nice design. easy to print. is there a reason not to do a single strip of .13mm strip 30mm wide and fold it in half? I read doing copper on copper is hard and rather just do this and keep within the niobi guidelines. a hair away from welding the pack and wondering why i dont read of more people doing thin copper and folding. i have seen a compleet e-bike pack welded 2.5mm nickel platet copper so there are companys use copper for the battery packs. This is a Taiwan company. I will shoot pics of a pack and post here. The welds are not so strong like nickel..but oke.you can see they use more current to get good welds an also a cut in the strips for maximal strong welds/good current flow over the tops from the cells. So. If I have .2mm copper strips with the nickel tabs spot welded to it. Could I take a 30mm wide copper strip and fold it to 10mm wide to increase the overall area and amp carrying ability while keeping it less than 18650 width. In the future I'm looking to do a 30q pack in the 8p size or more. But that puts you above 160a. Granted it's not a continuous draw number. I'm wondering how well some of the large P copper welded packs you guys have made are holding up and what kind of amp draw you're able to pull. Thanks for the chart! Good to know my 3.5mm pure copper wick wire is going to deliver a ton of amps without any issues! 160 A from 8p30Q is a bit ambitious. it might do it for a second but the sag will make it not very fun and you will be trashing the cells. my copper packs, 22s 12p and 18p 30q are holding up nicely. has anyone toyed with using multiple mots in parallel to get enough juice to do copper welding? perhaps someone could shed some light on weather or not it would, in theory, work and any other hints that would help? Any progress on this topic? I got myself a 0.005" (0.127mm) roll of 110 aka C11000 copper (IACS 101%), 12 feet by 12 inch. 16.99$ from K&S precision metal (Item stock number : #6020). So did you buy directly from them? Looks like it could work? I'm married so you know I'm no stranger to pain! If you are using copper it of utmost importance to never touch it with bare skin and to clean it thoroughly with isopropal alcohol before spotwelding. Avoid corrosion - oils and acids in the skin are not what you want on the copper, especially when there is current flowing through it. If it has been touched/fingerprinted - don't use these bits. You can parallel transformers, it's pretty simple but you have to get the windings around the right way otherwise you are shorting one to the another. when i get them together, (i think ill try 3 or 4) should be fun times. another thing, the arc welder spotwelder i have actually has 2 primaries and 2 secondaries. so far i have only been using it with one primary engaged i think, as the 2 primaries in series gave too low voltage at output so we just left one disconnected, which was ok for nickel, but perhaps putting the 2 primaries in parallele might be the key here..
and perhaps ditching the central dampening block alogether. Just found this thread and loved it. Got a lot of good info. 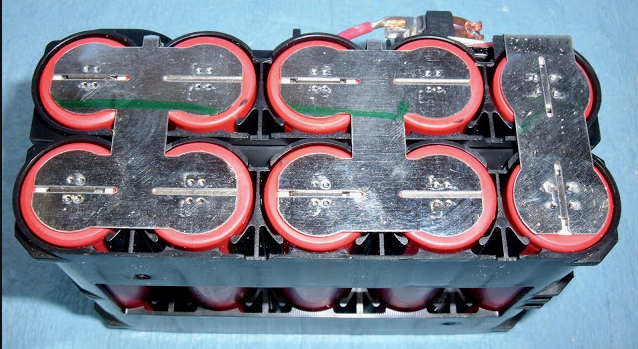 Started making my own batteries after buying and building up a BBSHD kit for my own bike and was using a typical shark pack 13.5ahs. After numerous rides I found I wanted more capacity for riding longer distances. So I did a little research and purchased a Sunko 709A spot welder and .15 x 8mm nickel strips. Designed a 31.5ah battery to fit inside the main triangle of my bike complete with BMS packed into a triangle zip bag with some padding around it and it fits good. After numerous rides I needed to open up pack as it wasn't performing like it should and found a number of spot welds had come loose from vibration but it was typically only on the top layer of strips the original bottom layers were good. So I was wondering why you couldn't just use solid nickel sheet as a solid piece instead of using copper and spot welding a nickel strip across the hole to weld onto the battery surface? I get that using copper increases current capacity as far as series connections go but with the motor controller limiting 30a max with the extra surface area from the solid nickel piece you would be fine. Found a place on line that sells 201 pure nickel 6"x12"x.005" for $6.95 each. I tried the .010 thick piece but this welder doesn't have enough power for a good penetrating weld onto a battery. We'll see if the thinner piece works or not. Any ideas? Im all ears. The design that I am currently impressed by is a broad sheet of copper as a bus-plate, with round holes over the cell locations. The connection between the copper bus-plates and the cell could initially be nickel, and depending on how experiments progress, possibly nickel-plated copper..